Some word processing programs are designed to work not only with plain text, but for coding (programming) as well. Some of such “notepads” became at least a functional addition to an IDE. 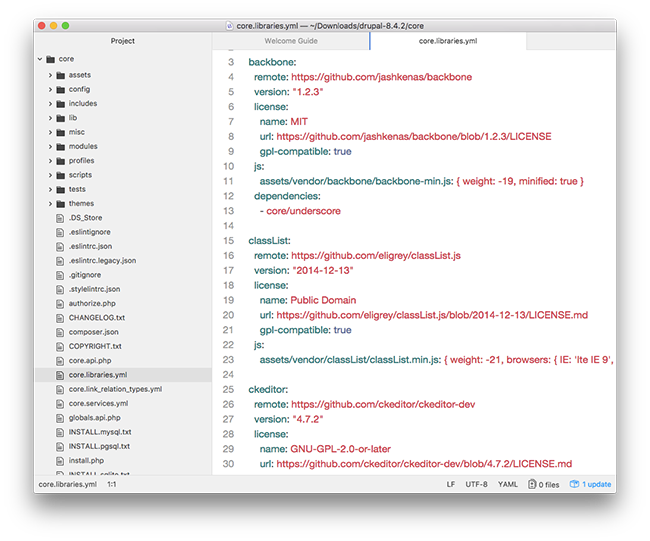 Atom is a modern open source editor optimized for coding. It is available for Linux / Mac OS / Windows and can be used together with an IDE or instead of it. Every open Atom tab is an autonomous web page (it uses Chromium engine for rendering). At the same time, it is a desktop app: it diagnoses a code, works with functions and classes and has standard syntax highlighting and autocomplete as well as code formatting. New features can be added using packages which are loaded directly via package manager. Atom editor will suit those who customize operational environment (that’s why it’s called hackable). Text configuration files are meant for this. However, this manager works perfectly without changing the settings, so you can start working on your projects straight away. On top of the possibility of adding features, configurations can be used to change interface. All the visualization options (fonts, colours) are set via a CSS/LESS file. If you don’t have time to set them manually, choose a theme from tons of those published by other community users. 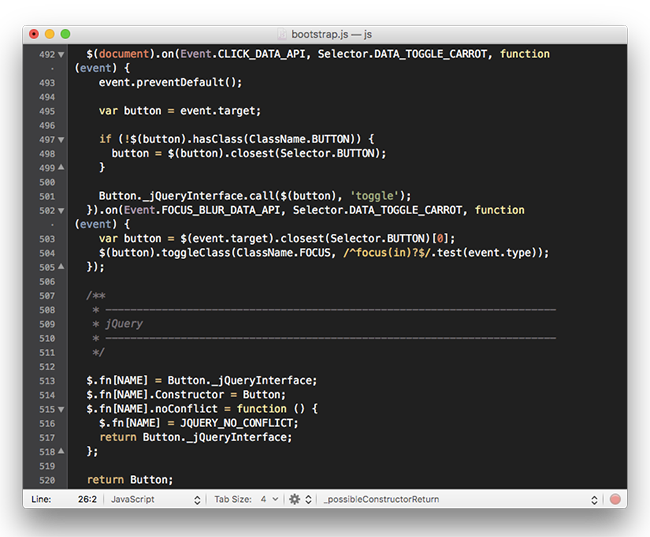 Sublime Text is another promising coding editor for Mac OS. Initially, many coders and other users are interested in the flexible interface settings and quick change of layouts during a coding process. Sublime can be operated with several tabs and pages switching promptly from file to file. There is also a side navigation menu and its own analogue of Spotlight Search. Sublime Text functionality is up to the mark. This code editing software was one of the first that offered functionality boosting packages. They are installed using a special menu. The settings of Sublime Text (as well as addition) can be changed through user configurations. 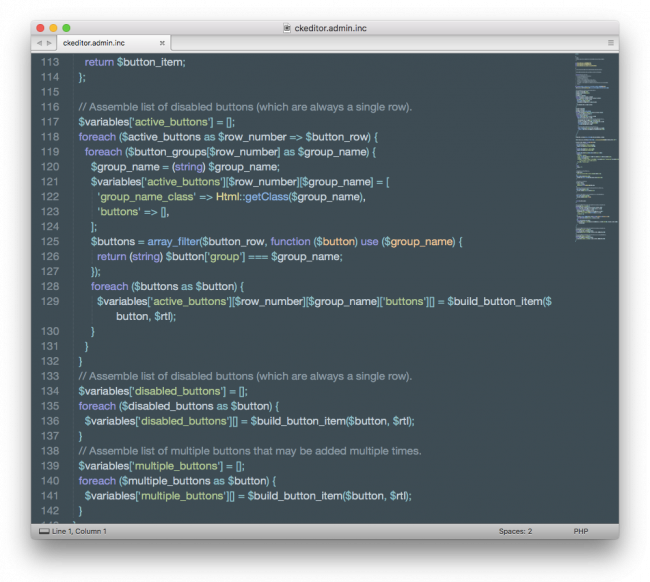 Productivity in Sublime Text is achieved due to many nice features. Along with the navigation noted above, it’s worth mentioning autocomplete, syntax highlighting and comfortable search by all files. It has also Goto Definition and Multiple Selections. The license key costs $80. The free version doesn’t have limitations but from time to time there will pop out a reminder window. As TextMate developers note, this text editor for coding on Mac is able to compensate for IDE system minuses. It is an easy-to-use and scalable app, unlike many slow IDE. Coders use TextMate code editor for its speed. And really, snippets and macros automatize coding noticeably. You can also set up macros that has already been written or write new ones to suit your tasks. TextMate is handy when formatting a code (Auto-Indent and Auto-Pairing features), navigating (Search and Replace supporting RegExp, Clipboard). It supports about fifty sets of programming language syntax, such as syntax highlighting and autocomplete. In addition to the named ones, this editor is good for projects and workspaces. Compared to the relatively new projects (Atom, Brackets), TextMate looks slightly oldschool and conservative, yet a lot of programmers and other users prefer solving problems using the text editor. A single user license costs 59.48 EUR. 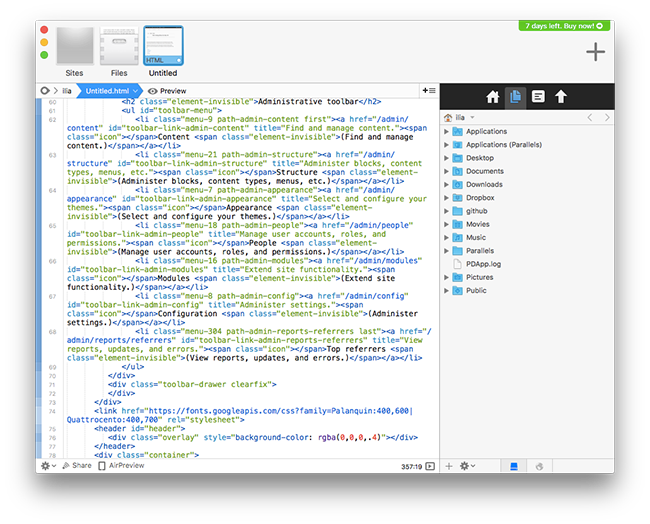 Coda is an editor used by Mac OS users, particularly those who edit in HTML and CSS. In the first place, for live preview feature and publication tools. An edited file can be uploaded to the server using FTP, SFTP, and WebDAV. With the right settings, synchronization in Coda will be going as a background one. In general, Coda has a standard ‘gentleman’ coding toolkit for Macintosh: syntax highlighting and autocomplete, as well as tabs, columns and extensions support – loads of little features which make it easier to work with any code and structure it. However, Coda’s main focus is on editing HTML markup and Cascading Style Sheets. The app has a built-in WebKit, consequently a user has access to such tools as web inspector and debugger. The product price is $99, which is a little higher than the price of any other editor with similar functions. Nevertheless, download a demo version of Coda and it should help you make up your mind. Brackets is another app for cleaning up your code. 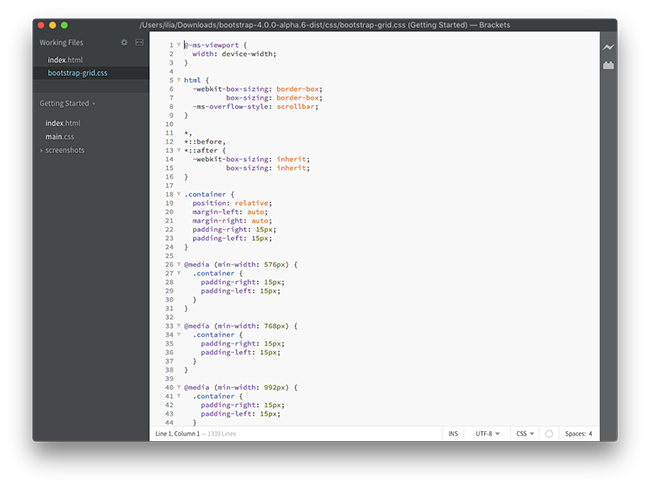 Although it’s not as functional as Sublime Text, it’s better suited for CSS, especially in terms of code navigation. It’s made in such a way that all the tools you need are at hand. No need to switch tabs, Brackets focuses on the code sections you need and offer links which lead to other files. Just like Coda, the emphasis here is on Live Preview which is in great demand for CSS and HTML editing. and many others. At the same time, Brackets can hardly be difficult to get around and it stays one of the most lightweight programming text editors for Mac OS.